monitoring and visualisation, providing additional features that will help to reduce downtime, enable fast recovery from simple errors, increase availability and boost production efficiency. 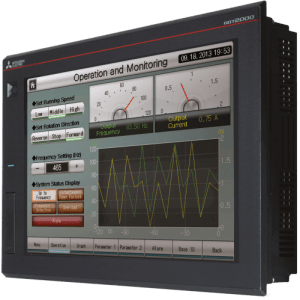 More than simply displaying data, these enhanced HMIs deliver genuine perspective on the automation process and provide a platform to solve the typical production problems that drive down OEE. The GOT2000 offers seamless connectivity to Mitsubishi Electric automation devices such as PLCs, variable speed drives, servo drives and robots, simplifying automation system set up. Inbuilt Ethernet communications means users can operate the GOT2000 remotely from a PC (VNC Server) or even from a tablet or portable terminal. An MES interface option enables the GOT2000 to transmit data collected from PLCs and other automation devices directly to higher level system databases, eliminating the need for gateway PCs or complex programming. Further the GOT2000 comes with the “FA transparent” function that enables users to link from a PC through the HMI to any supported connected automation products. Benchmark performance: New high-speed processors deliver responsible HMI operation even during high-load activities. Monitoring speed and booting time is twice as fast as the previous flagship GOT1000 model. Increased memory size: With memory four times greater than the models they replace, GOT2000 HMIs enable flexible screen design without any concerns regarding data capacity. The product data compression technology plus up to 128 MB with the use of a standard SD card make it possible. Multi-touch/gestures: GOT2000 series HMIs deliver tablet-like usability with the introduction of multi-touch and gestures, even when wearing gloves. Screen gestures enable users to easily enlarge screens for better visualization and easy operation of small switches. Beautiful graphics: GOT2000 HMIs provide 65536 colours and support a wide range of image formats – including png – for clear screens with well defined objects that are crisp even when enlarged or reduced. Advanced communications: All GOT2000 HMIs provide Ethernet, RS232 and RS422/482 communications. SD card and front and rear USB ports deliver increased flexibility. Options include wireless LAN interface for communication with PCs and tablets, enabling users to download/upload screen data and use the FA transparent function. Easy screen design: Fully compatible with GT Works3 software for screen design, with features such as the ability to use templates and sample projects to greatly reduce the number of steps in the screen creation process. Backwards compatibility: Providing an advanced solution for today’s monitoring and visualization requirements, the GOT2000 HMIs provide significant improvements on the GOT1000 models that they replace, while ensuring backwards compatibility: panel sizes remain identical whilst existing projects can be easily ported to the new HMIs.